Settle Inn - Colchester / Cannonville Accommodation. Settle Inn is nestled in the beautiful Sundays River Village of Colchester, 40 km east of the city of Port Elizabeth and situated on the banks of the Sundays River approximately 800 meters from the Addo Elephant National Parks’ new Southgate entrance, Camp Matyholweni. The source of the 250 kilometer long Sundays River, originally known as the Nukakamma by the native Khoisan people, is in the Sneeuberge, the highest mountain range in South Africa outside the Drakensberg and runs through the beautiful Sunday River Valley and empties into the majestic Indian Ocean. Settle Inn offers tastefully furnished, luxury self-catering accommodation with a choice of two modern units, approximately 80 meters from the banks of the Sundays River offering entertainment and fun for the entire family, you can choose between surf or river fishing, bird watching, canoeing or just relaxing with a good book on the jetty taking in the breathtaking ambiance. Whether you and the family require a relaxing tranquil break or a full on vacation, Settle Inn is ideally situated within close proximity of the world famous game reserves of Addo, Shamwari, Schotia, Kariega, Lalibella and the small towns of Port Alfred, Bushman's River, Kenton-on-Sea, Jeffery's Bay, Tsitsikamma and even Plettenberg Bay leaving you spoilt for choice when deciding on day trips. Two large, tastefully furnished and fully equipped homes are available for your comfort and relaxation. The main bedroom is fitted with a queens size bed has an en-suite bath room (Shower and bath). Sliding door opening onto the garden. Fitted with built in cupboards. The bedroom is fitted with two single beds. The lounge area seats six persons comfortably. A plasma TV screen with full DSTV bouquet is available. We pride ourselves with the well equipped kitchen available to you. Although the facility only accommodates six persons per night additional crockery and cutlery to entertain visitors has been included. The lapa is for the exclusive use of the unit. The splash pool is there for the exclusive use of the unit. The spacious main bedroom fitted with a queen size bed has an en-suite bath room (Shower and bath) with stack doors opening into an enclosed private area. Access to braai are in Lapa. Secure private entrance and parking for one vehicle. The lounge area seats 5 persons comfortably. A plasma TV screen with full DSTV bouquet is available. Although the facility only accommodates five persons per night additional crockery and cutlery to entertain visitors has been included. 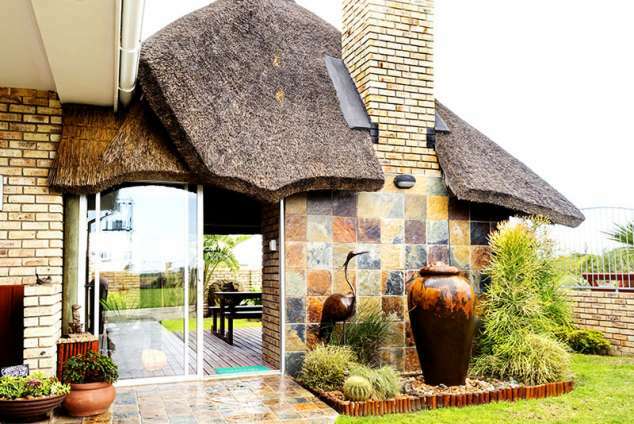 Residents occupying this unit has access to the thatched Lapa. Residents occupying this unit has access to the swimming pool. 7576 page views since 11 Feb, 2013. Last updated on 14 Mar, 2019.